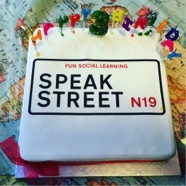 Speak Street Celebrate its 3rd Birthday! We were also joined by the mayor of Islington, Cllr Una O’Halloran. 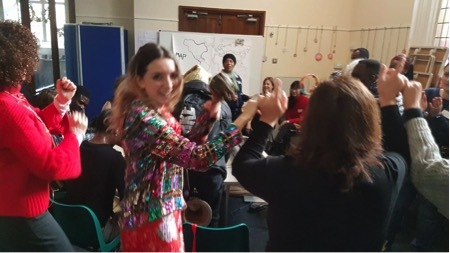 There was such a fun atmosphere and everyone had a great time joining in with the instruments that were provided by Creatives Against Poverty. It was a great way for us to get together and wish Speak Street a happy anniversary, showing how much it has grown over the past few years. For me one of the highlights of the party was when everyone got together to sing happy birthday, which was really heartwarming! Here’s hoping Speak Street continues to grow and be an inspiring, positive community. A big thanks to founder Joanna Bevan and everyone who came along to the party! 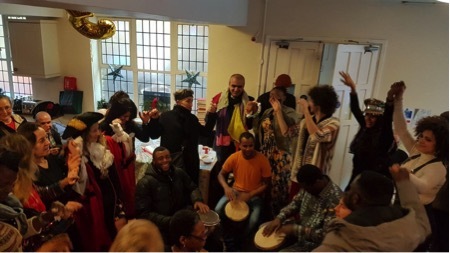 You can read more about our third year celebrations in the Camden New Journal and the Islington Gazette. Previous post Speak Street at the Skip Garden Cookbook Next post Speak Street featured in Islington Life on Social Saturday!